We’re encouraging our staff, supply chain and stakeholders to get involved in raising money for our Charity of the Year, Little Hiccups, and our latest event was much more colourful than usual! 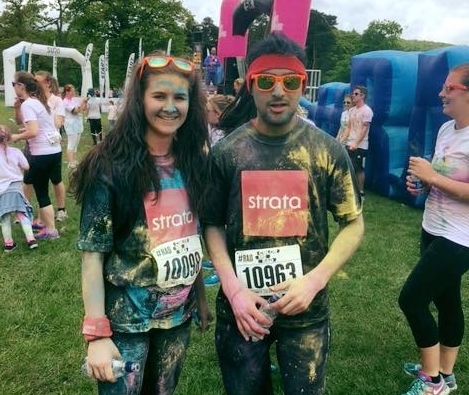 Trainee Architect Harriet French tackled the Colour Me Rad 5k run with her colleague Hamid Jabbar. Here she tells us more about what motivated her to take on the course and what it entailed. I decided to do something for our Charity of the Year and Colour Me Rad seemed like a fun way to get involved. I’ve been with Strata for a year now and was keen to get involved in supporting this fantastic cause in 2016. I signed up to the challenge with Hamid, who works in our legal department. We both couldn’t wait to see what was in store as we headed to the Harewood House Estate in Leeds. The event was packed. Hundreds of people were waiting to tackle the course and the atmosphere was amazing. Once the starting pistol sounded, we ran through various colour stations where we were pelted with powder and liquid. They were coming at us from all angles! The event was just for fun, so we weren’t racing against the clock or anyone else who was taking part. Hamid and I made it to the finish line in under half an hour, a time we were both pretty impressed with. Everyone gathered at the end of the race for one final colour throw, so if we weren’t already coated, we certainly were by the end! The race was definitely as much fun as I’d hoped it would be. I managed to raise a total of £151 for Little Hiccups. It’s a really inspiring cause and I’m glad to have been able to help with this year’s fundraising efforts. You can find out more about this amazing cause in our blog post all about Little Hiccups. Alternatively, you can donate here to show your support for Little Hiccups. Remember to take a look at our charity and events calendar for more information on what other fundraising activities we have planned. And why not get involved? !